A humorous tweet on the Foreign Ministry's official account made international headlines this week. 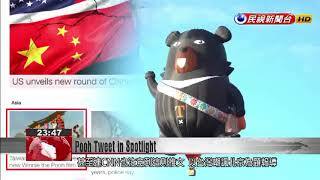 The tweet featured a Formosan black bear expressing dismay that his "cousin" Winnie the Pooh's new film had fallen victim to censorship in China. The tweet quickly rose to internet fame. It even made international news, only to be deleted by the Foreign Ministry soon afterward. Disney's "Christopher Robin" was recently banned from theaters in China, apparently because of Xi Jinping's sensitivity to Pooh comparisons. Taiwan's Foreign Ministry issued a timely tweet this week that poked a bit of fun at the Chinese leader. The Foreign Ministry posted an image of Taiwan's tourism mascot Oh! Bear, with an English caption that read "All bears are created equal in #Taiwan & @DisneyCRobin is screening nationwide." The tweet was widely liked on Twitter, and it starred in a CNN report titled "Taiwan mocks Beijing over new Winnie the Pooh film." Less than a half day after the CNN report, the Foreign Ministry deleted the tweet. I feel that the word "mock" is a complete misinterpretation of the original tone of our tweet. The official was asked whether the Mainland Affairs Council, which is tasked with cross-strait affairs, had played a role in the tweet's removal.